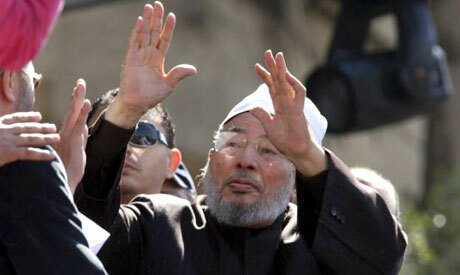 Yusuf al-Qaradawi waves to crowds in Tahrir square in Cairo, February 2011, (Photo: AP). He had been due to attend the UOIF congress at Le Bourget near Paris on 6 April alongside renowned Egyptian preacher Mahmoud al-Masri. Qaradawi, an internationally renowned Islamic scholar, is known to be the spiritual leader of Egypt's Muslim Brotherhood. He lives in Qatar since being exiled in the 1960s by then president Gamal Abdel Nasser. Qaradawi has been also banned from entering the United States since 1999.